As the 3-star Hotel Mercurio is a Hotel in Venice near Rialto Bridge and La Fenice Theater, opera lovers will find that this hotel is an excellent solution for a cultural stay in Venice. This hotel in Venice, located in the historic center, near Rialto Bridge and La Fenice Theater, very close to the St. Mark’s Square and Basilica, and Palazzo Grassi exhibitions. Venice art lovers may explore every corner of the city starting from Hotel Mercurio. As Via XXII Marzo is located at a stone’s throw from the hotel, shopping lovers can count on finding the most popular shops and boutiques. Nearby, historic 15th century Palazzo Contarini dal Bovolo is renowned for its characteristic external spiral staircase. The nearby Church of San Moisè is characterized by an elaborate baroque façade with a 14th-century Venetian style bell tower and terracotta spire. Inside the church, the major altar is a statue representing Mount Sinai, where Moses climbed to receive the Tablets of the Law. This church also contains some 17th- and 18th-century paintings, such as Tintoretto’s Washing of the Feet. Worthy of notice is the 18th-century organ located on the entrance wall, which represents details from the story of Moses. From here, it’s approximately one hundred yards to the beautiful Saint Mark’s Square, dominated by the Basilica and the Ducal Palace. These magnificent monuments that Hotel Mercurio whole-heartedly recommends, represents fascinating centuries of history, art, and manifestations of the civil and religious powers of Venice at the time of its maximum splendor. Saint Mark’s is a starting point for excursions to the islands of Murano, Burano and Torcello. On Murano, sacred land of artistic glasswork, visit the Glass Museum and the factories that offer tours of their shops. 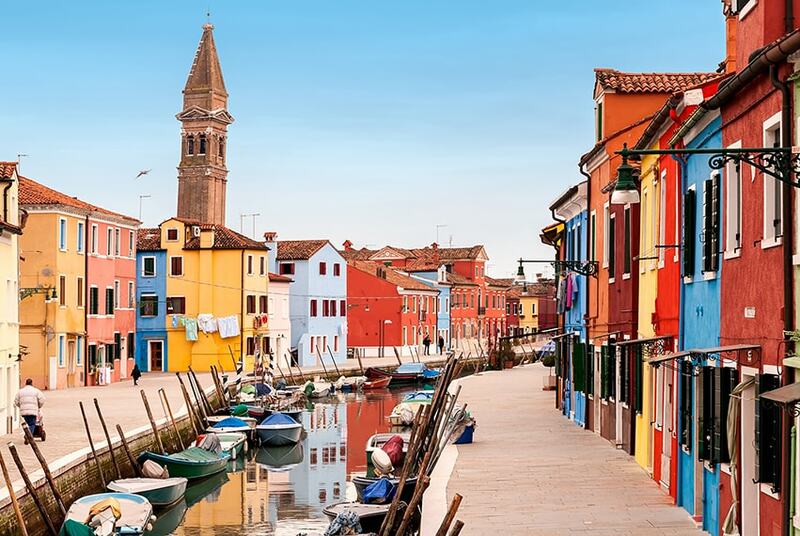 Burano is a delightful island known for its characteristic colorful houses and lace works. The island of Torcello, which used to be a busy commercial island but has since become the idyllic home to a few tens of inhabitants cannot be missed for the remains of ancient settlements like the basilica and museum that preserves precious finds from the Paleochristian area, the High Middle Ages and the Middle Ages. From the Venice Marco Polo airport (VCE), take an Alilaguna ferry that stops at San Marco. Alternatively, take the ATVO shuttle bus to Piazzale Roma (Venice’s car terminal). From here continue with vaporetto Actv line 1 or 2 and get off after about half an hour at the Vallaresso stop. Continue on foot along Calle Vallaresso and go straight on along La Frezzeria. At the end of the road, turn left toward La Fenice theater. You’ll find the hotel after going past the first bridge. From Treviso’s Antonio Canova airport (TSF): take the ATVO shuttle bus to Venice - Piazzale Roma. Follow the directions under "By Air". Starting from the ferry stop just outside of the Venezia Santa Lucia train station, take Actv ferry line 1 or 2 toward San Marco and, approximately 30 minutes, get off at the Vallaresso stop. Follow the directions under "By Air". From highways A4 Milano-Venezia and A27 Belluno-Venezia, follow signs to Venezia. Leave your car at one of the parking lots at the Tronchetto (on your right, right after the “Ponte della Libertà” bridge that leads to Venice) or at the Piazzale Roma car terminal, located right past the bridge. From here, take the Actv line 1 or line 2 ferry towards San Marco and get off at the Vallaresso stop. Follow the directions under "By Air". 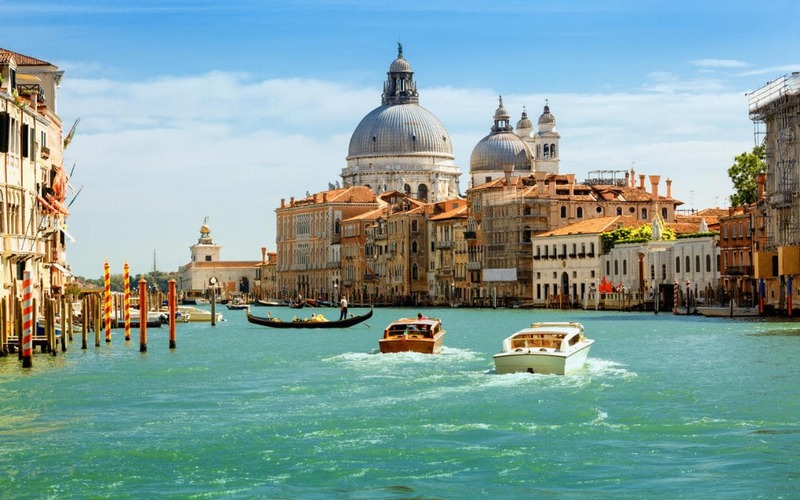 Thanks to its immediate proximity to a dock, reaching our hotel by water taxi is very convenient, both from the train station and from the Venice airport.